The unconditional surrender of Germany on May 8, 1945, and Japan on September 2, 1945, brought World War II to an end. Various documents and treaties placed stringent terms on Axis powers to prevent future hostilities. The German Instrument of Surrender ended World War II in Europe on the night of May 8, 1945. The surrender of Japan was announced by Imperial Japan on August 15 and formally signed on September 2, 1945, bringing the hostilities of World War II to a close. Their terms of surrender included disarmament and occupation by Allied forces. The terms of Italy’s defeat were determined during the Paris Peace Conference in 1947, and included limits on their military and a ban on all fascist organizations. Potsdam Declaration: A statement that called for the surrender of all Japanese armed forces during World War II. unconditional surrender: A surrender in which no guarantees are given to the surrendering party. Paris Peace Treaties: A series of document wherein victorious wartime Allied powers negotiated the details of peace treaties with minor Axis powers, namely Italy (though it was considered a major Axis Power), Romania, Hungary, Bulgaria, and Finland, following the end of World War II in 1945. German Instrument of Surrender: The legal document that established the unconditional surrender of Germany in World War II. The German Instrument of Surrender ended World War II in Europe. The definitive text was signed in Karlshorst, Berlin on the night of May 8, 1945 by representatives of the three armed services of the Oberkommando der Wehrmacht (OKW) and the Allied Expeditionary Force together with the Supreme High Command of the Red Army, with further French and U.S. representatives signing as witnesses. An earlier version of the text was signed in a ceremony in Reims in the early hours of May 7, 1945, but the Soviets rejected that version as it underplayed their role in the defeat of Germany in Berlin. In the West, May 8 is known as Victory in Europe Day, whereas in post-Soviet states the Victory Day is celebrated on May 9 since the definitive signing occurred after midnight Moscow time. The instrument of surrender itself followed in fourteen articles. The second part, articles 1-5, related to the military surrender by the German High Command of all forces on land, at sea, and in the air, to the surrender of their weapons, to their evacuation from any territory outside German boundaries by December 31, 1937, and to their liability to captivity as prisoners of war. The third part, articles 6 to 12, related to the surrender by the German Government to Allied Representatives of almost all its powers and authority, the release and repatriation of prisoners and forced laborers, the cessation of radio broadcasts, the provision of intelligence and information, the non-destruction of weapons and infrastructure, the yielding of Nazi leaders for war-crime trials, and the power of Allied Representatives to issue proclamations, orders, ordinances, and instructions covering “additional political, administrative, economic, financial, military and other requirements arising from the complete defeat of Germany.” The key article in the third part was article 12, providing that the German Government and German High command would comply fully with any proclamations, orders, ordinances, and instructions of the accredited Allied Representatives; this was understood by the Allies as allowing unlimited scope to impose arrangements for the restitution and reparation of war damages. Articles 13 and 14 specified the date of surrender and the languages of the definitive texts. In the event of the German signings of Instruments of Surrender at Reims and Berlin, the EAC text was not used; a simplified, military-only version, based largely on the wording of the partial surrender instrument of German forces in Italy signed at Caserta, was applied instead. The reasons for the change are disputed, but it may reflect awareness of reservations as to the capability of the German signatories to agree the provisions of the full text. With the Potsdam Agreement, signed on August 12, 1945, the Allied leaders planned the new post-war German government, resettled war territory boundaries, de facto annexed a quarter of prewar Germany situated east of the Oder-Neisse line, and mandated and organized the expulsion of the millions of Germans who remained in the annexed territories and elsewhere in the east. They also ordered German demilitarization, denazification, industrial disarmament, and settlements of war reparations. German Instrument of Surrender: The first instrument of surrender signed at Reims on May 7, 1945. On August 6, 1945, at 8:15 a.m. local time, the U.S. detonated an atomic bomb over the Japanese city of Hiroshima. Sixteen hours later, American President Harry S. Truman called again for Japan’s surrender, warning them to “expect a rain of ruin from the air, the like of which has never been seen on this earth.” Late in the evening of August 8, 1945, in accordance with the Yalta agreements but in violation of the Soviet-Japanese Neutrality Pact, the Soviet Union declared war on Japan, and soon after midnight on August 9, 1945, invaded the Imperial Japanese puppet state of Manchukuo. Later in the day, the U.S. dropped a second atomic bomb, this time on the Japanese city of Nagasaki. Following these events, Emperor Hirohito intervened and ordered the Supreme Council for the Direction of the War to accept the terms the Allies had set down in the Potsdam Declaration for ending the war. After several more days of behind-the-scenes negotiations and a failed coup d’état, Emperor Hirohito gave a recorded radio address across the Empire on August 15. In the radio address, called the Jewel Voice Broadcast, he announced the surrender of Japan to the Allies. that the “Japanese sovereignty shall be limited to the islands of Honshū, Hokkaidō, Kyūshū, Shikoku and such minor islands as we determine.” As had been announced in the Cairo Declaration in 1943, Japan was to be reduced to her pre-1894 territory and stripped of her prewar empire including Korea and Taiwan, as well as all her recent conquests. On August 28, the occupation of Japan by the Supreme Commander for the Allied Powers began. The surrender ceremony was held on September 2 aboard the United States Navy battleship USS Missouri, at which officials from the Japanese government signed the Japanese Instrument of Surrender, thereby ending the hostilities. The Treaty of Peace with Italy (one of the Paris Peace Treaties) was signed on February 10, 1947 between Italy and the victorious powers of World War II, formally ending hostilities. It came into general effect on September 15, 1947. Articles 47 and 48 called for the demolition of all permanent fortifications along the Franco-Italian and Yugoslav-Italian frontier. Italy was banned from possessing, building, or experimenting with atomic weapons, guided missiles, guns with a range of over 30 km, non-contact naval mines and torpedoes as well as manned torpedoes (article 51). The military of Italy was limited in size. Italy was allowed a maximum of 200 heavy and medium tanks (article 54). Former officers and non-commissioned officers of the Blackshirts and the National Republican Army were barred from becoming officers or non-commissioned officers in the Italian military (except those exonerated by the Italian courts, article 55). The Italian navy was reduced. Some warships were awarded to the governments of the Soviet Union, the United States, the United Kingdom and France (articles 56 and 57). Italy was ordered to scuttle all its submarines (article 58) and banned from acquiring new battleships, submarines, and aircraft carriers (article 59). The navy was limited to a maximum force of 25,000 personnel (article 60). The Italian army was limited to a size of 185,000 personnel plus 65,000 Carabinieri for a maximum total of 250,000 personnel (article 61). The Italian air force was limited to 200 fighters and reconnaissance aircraft plus 150 transport, air-rescue, training, and liaison aircraft, and was banned from owning and operating bomber aircraft (article 64). The number of air force personnel was limited to 25,000 (article 65). Article 17 of the treaty banned Fascist organizations (“whether political, military, or semi-military”) in Italy. Some 75 million people died in World War II, including about 20 million military personnel and 40 million civilians, many of whom died because of deliberate genocide, massacres, mass-bombings, disease, and starvation. World War II was the deadliest military conflict in history in terms of total dead, with some 75 million people casualties including military and civilians, or around 3% of the world’s population at the time. Many civilians died because of deliberate genocide, massacres, mass-bombings, disease, and starvation. The Soviet Union lost around 27 million people during the war, including 8.7 million military and 19 million civilians. This represents the most military deaths of any nation by a large margin. Germany sustained 5.3 million military losses, mostly on the Eastern Front and during the final battles in Germany. Of the total number of deaths in World War II, approximately 85 percent were on the Allied side and 15 percent were on the Axis side, with many of these deaths caused by war crimes committed by German and Japanese forces in occupied territories. Nazi Germany, as part of a deliberate program of extermination, systematically killed over 11 million people including 6 million Jews. In addition to Nazi concentration camps, the Soviet gulags (labor camps) led to the deaths of 3.6 million civilians. gulag: The government agency that administered the main Soviet forced labour camp systems during the Stalin era, from the 1930s until the 1950s. Executive Order 9066: A United States presidential executive order signed and issued during World War II by the United States President Franklin D. Roosevelt on February 19, 1942, authorizing the Secretary of War to prescribe certain areas as military zones, clearing the way for the deportation of Japanese Americans and Italian-Americans to internment camps. “unworthy of life”: In German, “Lebensunwertes Leben,” this term was a Nazi designation for the segments of the populace which, according to the Nazi regime of the time, had no right to live. Estimates for the total number of casualties in the war vary because many deaths went unrecorded. Most suggest that some 75 million people died in the war, including about 20 million military personnel and 40 million civilians. Many civilians died because of deliberate genocide, massacres, mass-bombings, disease, and starvation. 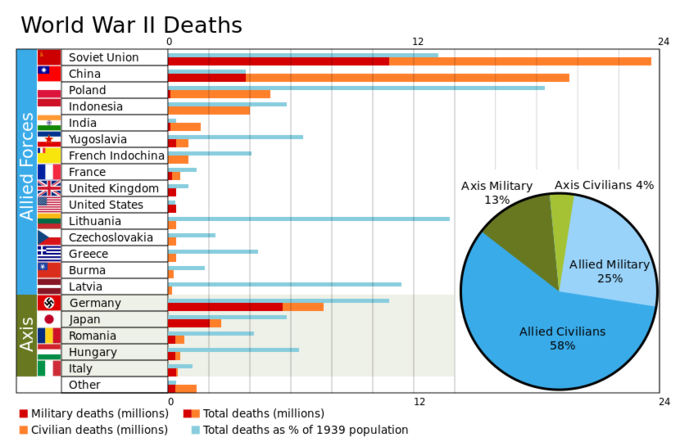 Of the total number of deaths in World War II, approximately 85 percent—mostly Soviet and Chinese—were on the Allied side and 15 percent on the Axis side. Many deaths were caused by war crimes committed by German and Japanese forces in occupied territories. An estimated 11 to 17 million civilians died either as a direct or as an indirect result of Nazi ideological policies, including the systematic genocide of around 6 million Jews during the Holocaust and an additional 5 to 6 million ethnic Poles and other Slavs (including Ukrainians and Belarusians), Roma, homosexuals, and other ethnic and minority groups. Hundreds of thousands of ethnic Serbs, along with gypsies and Jews, were murdered by the Axis-aligned Croatian Ustaše in Yugoslavia, and retribution-related killings were committed just after the war ended. In Asia and the Pacific, between 3 million and more than 10 million civilians, mostly Chinese (estimated at 7.5 million), were killed by the Japanese occupation forces. The best-known Japanese atrocity was the Nanking Massacre, in which 50 to 300 thousand Chinese civilians were raped and murdered. Mitsuyoshi Himeta reported that 2.7 million casualties occurred during the Sankō Sakusen. General Yasuji Okamura implemented the policy in Heipei and Shantung. Axis forces employed biological and chemical weapons. The Imperial Japanese Army used a variety of such weapons during its invasion and occupation of China and in early conflicts against the Soviets. Both the Germans and Japanese tested such weapons against civilians and sometimes on prisoners of war. The Soviet Union was responsible for the Katyn massacre of 22,000 Polish officers and the imprisonment or execution of thousands of political prisoners by the NKVD in the Baltic states and eastern Poland annexed by the Red Army. The mass-bombing of civilian areas, notably the cities of Warsaw, Rotterdam and London, included the aerial targeting of hospitals and fleeing refugees by the German Luftwaffe, along with the bombings of Tokyo and the German cities of Dresden, Hamburg, and Cologne by the Western Allies. These bombings may be considered war crimes. The latter resulted in the destruction of more than 160 cities and the death of more than 600,000 German civilians. However, no positive or specific customary international humanitarian law with respect to aerial warfare existed before or during World War II. World War II Casualties: Estimates suggest that some 75 million people died in World War II, including about 20 million military personnel and 40 million civilians. The German government led by Adolf Hitler and the Nazi Party was responsible for the Holocaust, the killing of approximately 6 million Jews, 2.7 million ethnic Poles, and 4 million others who were deemed “unworthy of life” (including the disabled and mentally ill, Soviet prisoners of war, homosexuals, Freemasons, Jehovah’s Witnesses, and Romani) as part of a program of deliberate extermination. About 12 million, mostly Eastern Europeans, were employed in the German war economy as forced laborers. In addition to Nazi concentration camps, the Soviet gulags (labor camps) led to the death of citizens of occupied countries such as Poland, Lithuania, Latvia, and Estonia, as well as German prisoners of war (POWs) and Soviet citizens who were thought to be Nazi supporters. Of the 5.7 million Soviet POWs of the Germans, 57 percent died or were killed during the war, a total of 3.6 million. Soviet ex-POWs and repatriated civilians were treated with great suspicion as potential Nazi collaborators, and some owere sent to the Gulag upon being checked by the NKVD. Japanese POW camps, many of which were used as labor camps, also had high death rates. The International Military Tribunal for the Far East found the death rate of Western prisoners was 27.1 percent (for American POWs, 37 percent), seven times that of POWs under the Germans and Italians. While 37,583 prisoners from the UK, 28,500 from the Netherlands, and 14,473 from the United States were released after the surrender of Japan, the number of Chinese released was only 56. According to historian Zhifen Ju, at least five million Chinese civilians from northern China and Manchukuo were enslaved between 1935 and 1941 by the East Asia Development Board, or Kōain, for work in mines and war industries. After 1942, the number reached 10 million. The US Library of Congress estimates that in Java, between 4 and 10 million rōmusha (Japanese: “manual laborers”), were forced to work by the Japanese military. About 270,000 of these Javanese laborers were sent to other Japanese-held areas in South East Asia, and only 52,000 were repatriated to Java. On February 19, 1942, Roosevelt signed Executive Order 9066, interning about 100,000 Japanese living on the West Coast. Canada had a similar program. In addition, 14,000 German and Italian citizens who had been assessed as being security risks were also interned. In accordance with the Allied agreement made at the Yalta Conference, millions of POWs and civilians were used as forced labor by the Soviet Union. Hungarians were forced to work for the Soviet Union until 1955. The Atlantic Charter set goals for the post-war world and inspired many of the international agreements that shaped the world thereafter, most notably the United Nations. The Atlantic Charter was a pivotal policy statement issued on August 14, 1941, that defined the Allied goals for the post-war world, including self-determination for nations and economic and social cooperation among nations. British Prime Minister Winston Churchill and U.S. President Franklin D. Roosevelt drafted the Atlantic Charter at the Atlantic Conference in Placentia Bay, Newfoundland in 1941. Adherents of the Atlantic Charter signed the Declaration by United Nations on January 1, 1942; it became the basis for the modern United Nations. In a September 1941 speech, Churchill stated that the Charter was only meant to apply to states under German occupation and not to people who formed part of the British Empire, a statement which became controversial and resulted in strong pushback from figures such as Gandhi. United Nations: An intergovernmental organization to promote international cooperation. A replacement for the ineffective League of Nations, the organization was established on October 24, 1945 after World War II to prevent another such conflict. self-determination: A cardinal principle in modern international law that states that nations, based on respect for the principle of equal rights and fair equality of opportunity, have the right to freely choose their sovereignty and international political status with no interference. The Atlantic Charter made it clear that America was supporting Britain in the war. Both America and Britain wanted to present their unity, mutual principles, and hopes for the post-war world and the policies they agreed to follow once the Nazis had been defeated. A fundamental aim was to focus on the peace that would follow and not specific American involvement and war strategy, although U.S. involvement appeared increasingly likely. The Atlantic Charter set goals for the post-war world and inspired many of the international agreements that shaped the world thereafter. The General Agreement on Tariffs and Trade (GATT), the post-war independence of European colonies, and many other key policies are derived from the Atlantic Charter. The public of Britain and the Commonwealth was delighted with the principles of the meetings but disappointed that the U.S. was not entering the war. Churchill admitted that he had hoped the U.S. would finally decide to commit itself. Regardless, the acknowledgement that all people had a right to self-determination gave hope to independence leaders in British colonies. The Americans were insistent that the charter was to acknowledge that the war was being fought to ensure self-determination. The British were forced to agree to these aims, but in a September 1941 speech, Churchill stated that the Charter was only meant to apply to states under German occupation, and certainly not to the peoples who formed part of the British Empire. Churchill rejected its universal applicability when it came to the self-determination of subject nations such as British India. Mohandas Gandhi in 1942 wrote to President Roosevelt: “I venture to think that the Allied declaration that the Allies are fighting to make the world safe for the freedom of the individual and for democracy sounds hollow so long as India and for that matter Africa are exploited by Great Britain…” Roosevelt repeatedly brought the need for Indian independence to Churchill’s attention, but was rebuffed. However Gandhi refused to help either the British or the American war effort against Germany and Japan in any way, and Roosevelt chose to back Churchill. India was already contributing significantly to the war effort, sending over 2.5 million men (the largest volunteer force in the world at the time) to fight for the Allies, mostly in West Asia and North Africa. The Axis powers interpreted these diplomatic agreements as a potential alliance against them. In Tokyo, the Atlantic Charter rallied support for the militarists in the Japanese government, who pushed for a more aggressive approach against the U.S. and Britain. The most striking feature of the discussion was that an agreement had been made between a range of countries that held diverse opinions, who were accepting that internal policies were relevant to the international problem. The agreement proved to be one of the first steps towards the formation of the United Nations. Atlantic Charter: Winston Churchill’s edited copy of the final draft of the Atlantic Charter. The Universal Declaration of Human Rights is a non-binding declaration adopted by the United Nations General Assembly in 1948, partly in response to the barbarism of World War II. The Universal Declaration of Human Rights (UDHR) arose directly from the experience of the Second World War and represents the first global expression of what many believe are the rights to which all human beings are inherently entitled. 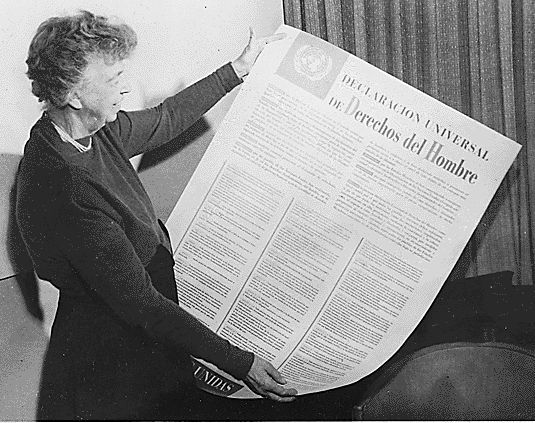 The UDHR was framed by members of the Human Rights Commission, with Eleanor Roosevelt as Chair, who began to discuss an International Bill of Rights in 1947. 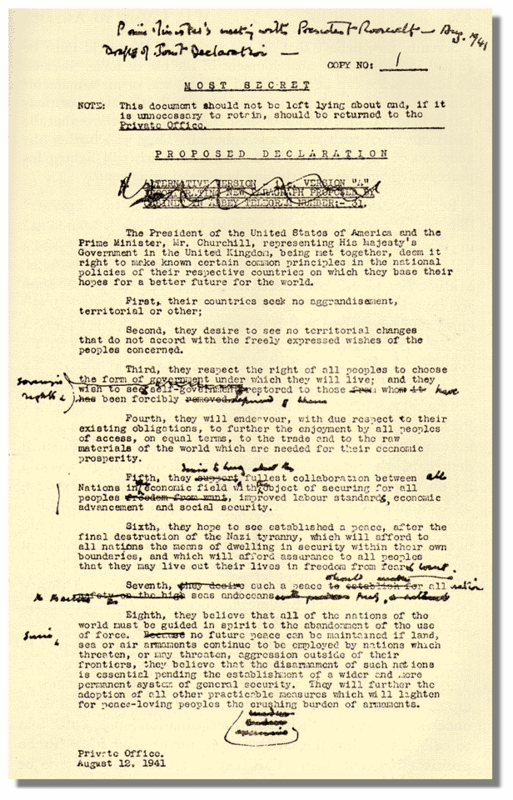 The Declaration consists of thirty articles which, although not legally binding, have been elaborated in subsequent international treaties, economic transfers, regional human rights instruments, national constitutions, and other laws, thereby making many of their principles legally binding in various nations. The United Nations (UN) is an intergovernmental organization to promote international cooperation established in 1945 after the end of WWII to replace the ineffectual League of Nations. Universal Declaration of Human Rights: A declaration adopted by the United Nations General Assembly in 1948, the first global expression of what many believe are the rights to which all human beings are inherently entitled. International Bill of Human Rights: The name given to UN General Assembly resolution 217 A (III) and two international treaties established by the United Nations. It consists of the Universal Declaration of Human Rights (adopted in 1948), the International Covenant on Civil and Political Rights (1966) with its two Optional Protocols, and the International Covenant on Economic, Social and Cultural Rights (1966). United Nations Charter: The foundational treaty of the United Nations, signed October 24, 1945. The Universal Declaration of Human Rights (UDHR) is a declaration adopted by the United Nations General Assembly on December 10, 1948 at the Palais de Chaillot, Paris. The Declaration arose directly from the experience of the Second World War and represents the first global expression of what many believe are the rights to which all human beings are inherently entitled. The UDHR urges member nations to promote a number of human, civil, economic, and social rights, asserting these rights are part of the “foundation of freedom, justice and peace in the world.” It aims to recognize, “the inherent dignity and of the equal and inalienable rights of all members of the human family is the foundation of freedom, justice and peace in the world.” The full text is published by the United Nations on its website. The UDHR was framed by members of the Human Rights Commission, with Eleanor Roosevelt as Chair, who began to discuss an International Bill of Rights in 1947. The members of the Commission did not immediately agree on the form of such a bill of rights and whether or how it should be enforced. The Declaration consists of 30 articles which, although not legally binding, have been elaborated in subsequent international treaties, economic transfers, regional human rights instruments, national constitutions, and other laws. The International Bill of Human Rights consists of the Universal Declaration of Human Rights, the International Covenant on Economic, Social and Cultural Rights, and the International Covenant on Civil and Political Rights and its two Optional Protocols. In 1966, the General Assembly adopted the two detailed Covenants, which complete the International Bill of Human Rights. In 1976, after the Covenants had been ratified by a sufficient number of individual nations, the Bill became an international law. The United Nations (UN) is an intergovernmental organization to promote international cooperation. A replacement for the ineffective League of Nations, the organization was established after World War II to prevent another such conflict. The United Nations Charter was drafted at a conference in April–June 1945; this charter took effect October 24, 1945, and the UN began operation. While not a treaty itself, the Declaration was explicitly adopted for the purpose of defining the meaning of the words “fundamental freedoms” and “human rights” appearing in the United Nations Charter, which is binding on all member states. For this reason, the Universal Declaration of Human Rights is a fundamental constitutive document of the United Nations. In addition, many international lawyers believe that the Declaration forms part of customary international law and is a powerful tool in applying diplomatic and moral pressure to governments that violate any of its articles. The 1968 United Nations International Conference on Human Rights advised that the Declaration “constitutes an obligation for the members of the international community” to all persons. The Declaration has served as the foundation for two binding UN human rights covenants: the International Covenant on Civil and Political Rights and the International Covenant on Economic, Social and Cultural Rights. The principles of the Declaration are elaborated in international treaties such as the International Convention on the Elimination of All Forms of Racial Discrimination, the International Convention on the Elimination of Discrimination Against Women, the United Nations Convention on the Rights of the Child, the United Nations Convention Against Torture, and many more. The Declaration continues to be widely cited by governments, academics, advocates, and constitutional courts, as well as by individuals who appeal to its principles for the protection of their recognized human rights. Even though it is not legally binding, the Declaration has been adopted in or has influenced most national constitutions since 1948. It has also served as the foundation for a growing number of national laws, international laws, and treaties, as well as regional, subnational, and national institutions protecting and promoting human rights.